If I know two things at all, I know these two things. 1) We are busy. 2) We love Mexican food. 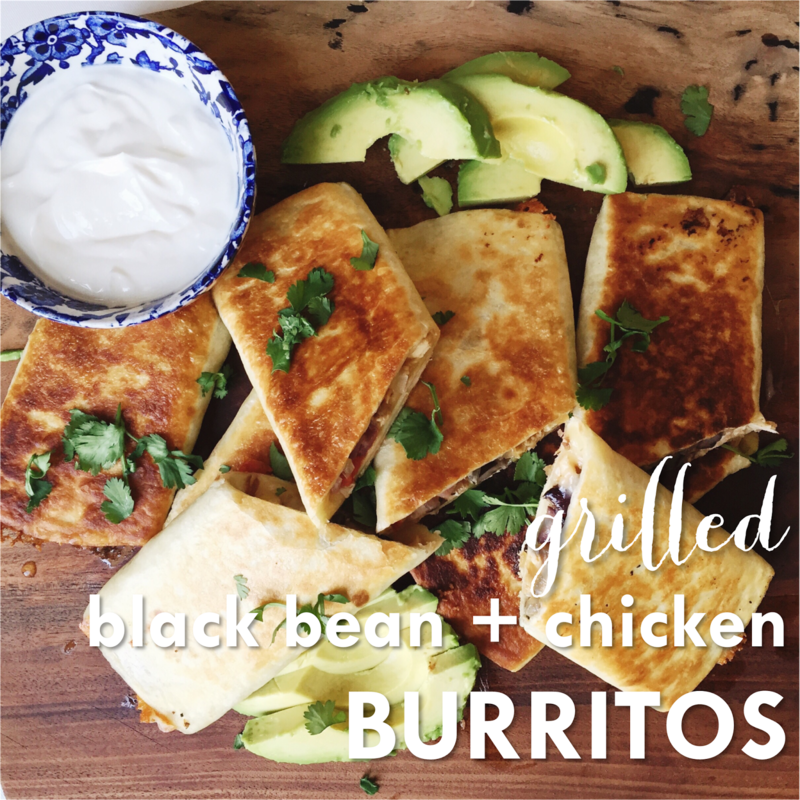 So combine those two things, and you've got a recipe for these grilled black bean and chicken burritos! It's a quick weeknight recipe that is a crowd-pleaser. YAY! The hero of this dish is rotisserie chicken that can be picked up and pulled apart in a snap. Then these burritos are filled with gooey, melted cheese, a warm sweet-and-spicy black bean salsa, and super seasoned chicken. Load 'em up, grill 'em up, slice 'em and serve 'em! Your people are gonna love them! Watch the online episode HERE with step-by-step instructions and fun! In a pot over medium-low heat, mix together and heat chicken, water, half of the juice from the Rotel can (keep the rest! ), lime juice, chili, cumin, and garlic powder. Stir and taste for seasoning, adding more as you’d like. Meanwhile, slice onion and saute in a little oil until tender and golden. In another pot over medium heat, mix together black beans, corn, the rest of the Rotel can, plus salt and pepper to taste. Down the center of one flour tortilla, layer chicken mixture, black bean mixture (use a slotted spoon to drain off liquid), then top with shredded monterey jack cheese. Fold each side in like a burrito and grill in a preheated non-stick skillet drizzled with a little oil. Weight the burrito with another skillet or heavy spatula while it cooks on both sides. Remove from skillet and repeat with remaining tortillas and fillings. Garnish with avocado, tomatoes, sour cream, and cilantro!